First there's the walk from the parking lot. Then, before that first satisfying drive he leans to the left. To the right. Forward. Backward. He makes windmill motions with his clubs. He tunes in to his back and shoulders thinks about them as he stretches. Five minutes later, Jim Spaw, a consultant at Kenton County (Ohio) Schools, is ready to play golf. If that sounds like a lot of bother. vou might want to reconsider. 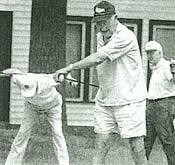 Bud Heyman (foreground), along with golfing partners Joe Dolan (left) and Spike Berg, stretch before teeing off at the American Legion Golf Course. "Stretching ... is probably the best form of exercise to get ready for spring and to avoid injuries," even for golfers, says Wayne E. Kelley, golf pro at Lunken Playfield's Reeves Golf Course, in Cincinnati. In addition to keeping you off the disabled list, a few simple exercises, "things you can do on the first tee before you start play," can help you play better golf too, he says. Now there is motivation. Here are some approaches. Paul Frediani, fitness adviser, personal trainer and author of "Golf Flex - 10 Minutes a Day to Better Play" (Hatherleigh; $9.95), designates these as body areas most important for a good golf game: upper back and shoulders, upper arms, lower back and trunk, hips, hands and wrists, hamstrings and quadriceps, calves, Achilles tendons and ankles. Remember to be consistent, maintain good posture and breathe deeply, he says. Never bounce or jerk and never force or strain your muscles when you stretch. A consistent stretching program will reduce soreness and increase power in your game, he says. By stretching regularly and frequently, you can increase your range of motion, relieve soreness and reduce muscle tension and stress. Frediani recommends stretching in a number of locations and situations, not just as you're about to begin a round of golf. Examples include: in bed, when you wake up in the morning; in the shower, reading the newspaper; getting dressed; at the office; and sitting in the car. "Stretching is especially good for seniors," Kelley says. At 57, he says he works out "three to four times a week, mostly stretches." Stretching regularly will decrease your chances of injury and increase your range of motion. Holding the club horizontally behind your neck, resting on your shoulders, twist your upper body left and right to stretch out your torso (left photo). Use one hand to hold the club's grip behind your head, and the other hand to hold the club's shaft at your lower back to stretch your arms and shoulders (right photo). Stand tall and place your feet together. Place the club behind your neck, resting it on your shoulders, and reach back with both arms and grab the club at the grip end and at the clubhead end. Rotate your body to the left and pause at the end of a comfortable range. Repeat the same motion to the right. Repeat six times in each direction. To increase shoulder flexibility (rotator cuff and joint capsule), stand erect, reach across your body and grasp the back of your elbow with the opposite hand. Pull that arm across your body and under your chin, as far back as you can. Repeat with both arms.